Pay only $598 when you pay in full! Become a successful planner of upscale events, weddings, parties, meetings, and celebrations! 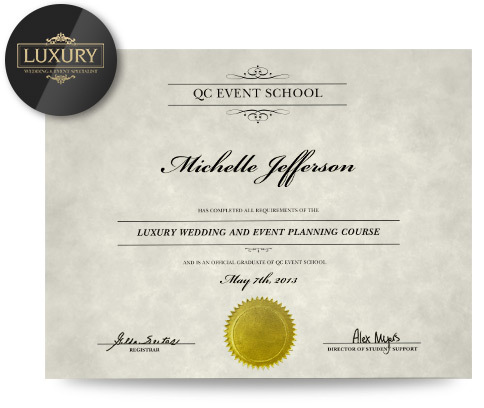 QC’s online Luxury Event and Wedding Planning Specialization course allows you to take your expertise to the next level. Learn how to work with large budgets, demanding clients, and find out how to build your own network of top suppliers and vendors. Discover how to market your services as a luxury event planner to high-end clients and companies. Organizing luxury events involves far more than managing large budgets. Luxury clients expect you to pay attention to the finest details—they want you to strive for perfection in all respects. QC shows you how to create “over-the-top” events that impress clients and guests alike. You’ll learn how to project luxury in your event planning business and brand. Note: This advanced specialization course assumes a degree of knowledge in the event and wedding planning industry. Students should have previous training in event and wedding planning, or relevant work experience before enrolling in this course. When you graduate from the Luxury Wedding and Event Planning course, you’ll receive a certificate of completion and the professional designation of Luxury Wedding and Event Specialist. This certificate will assure your credibility in the industry to future clients and employers. Learn what makes an event ‘luxury’, and find out how to offer luxury service to your clients. Explore the ways in which you can personalize events to give your clients a unique experience, and learn how to please demanding clients. Find out which marketing channels are best for reaching luxury clients with your brand. Develop marketing messages that will attract luxury clientele. Learn how color schemes can enhance your brand and convey a luxury brand. Find out how to qualify your clients, conduct client consultations, and draft contracts for luxury clientele. Understand how to structure budgets for luxury weddings and events. Establish a step-by-step timeline for luxury events. Discover various pricing models and learn how to charge for your services. Learn the types of vendors you’ll work with as a luxury planner, and find out what to look for in these vendors. Explore strategies for developing lasting relationships with good vendors. Find out how to keep up with and set trends in the luxury event planning industry. Review a detailed course outline here. QC sends you everything you need to complete the Luxury Wedding and Event Planning course, including lesson texts, course guides, and video tutorials. You’ll gain lifetime access to QC’s Online Student Center where you can find electronic copies of your course materials, submit assignments, chat with peers, and review your unit evaluations from your tutor. Download a Course Preview to get an inside look at the Luxury Wedding and Event Planning course. It’s easy to get started with QC—enroll in the Luxury Wedding and Event Planning course and you’ll learn all the ins-and-outs of the luxury events industry. Bring your career to the next level with QC’s advanced specialization course! When you enroll with QC you are never alone. We will support you every step of the way to help you reach your goals! Have questions about this specialization course? Contact us!